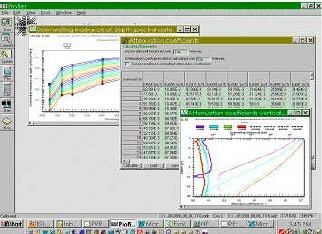 Profiler operating a PUV-2500 The Windows-based Profiler software package performs data acquisition and contains a suite of powerful data analysis tools for the PRR and PUV series instruments. Graph customization including selectable fonts, gridlines, data labels, etc. Profiler software is designed to run under the Windows 98, NT, 2000, XP, or Windows 7 environment. We recommend at least a 200-MHz Pentium computer with at least 64 MB of RAM.